Clearly, she has her BA in Communications from Wilfrid Laurier! 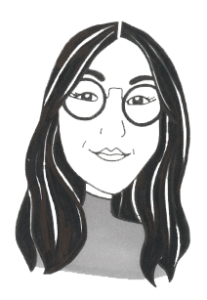 Jen is one of our eyewear consultants and her favourite lines are Bruno Chaussignand, Matsuda and Harry Lary’s. When she’s chillin’, Jen loves discovering new music, walking in Waterloo Park and watching her hair turn gray. The best local independent shops, according to Jen, are Ethel’s Lounge for Taco Tuesdays, The Clay & Glass Gallery for the latest installations and buying sweaters from Andie’s Boutique.